In his recent book From Empires to NGOs in the West African Sahel, historian Gregory Mann describes how state sovereignty was fashioned in the Sahel following the end of colonial rule. In the previous post, we discussed his concept of “nongovernmentality” and the evolution of new sovereignties through the interaction (sometimes adversarial, often quite cooperative) between international NGOs and Sahelian governments, particularly during the 1970s and 1980s. In this post, our discussion focuses on three areas of resonance between Mali’s present-day political tensions and those afflicting its accession to independence during the late 1950s and the early 1960s, when Modibo Keita’s Union Soudanaise-Rassemblement Démocratique Africain (US-RDA) was in power. BfB: In chapter 2 you describe how the US-RDA campaigned on a platform of undermining traditional authority, with the aim of centralizing power in a secular, modern state structure. Today we’re seeing pushback against that modernist approach, and the latest peace agreement being promoted would cede some power to traditional and Islamic authorities. Former Prime Minister Soumana Sako recently accused those who drafted the agreement as mounting a “frontal assault against the Republic and an attempt to return it to the colonial order under which our People suffered so much.” Reading this section of your book, I thought “Aha, so this is where that comes from.” How strong was the perception, back in the 1960s, that traditional authority and the modern state are like matter and anti-matter? Is that even a viable metaphor? GM: That’s a great metaphor—I don’t know if it’s one I would use in print, but I see exactly what you mean. What the US-RDA thought they were doing was pursuing an anticolonialist sort of emancipatory politics. In practice, what they ended up doing, by destroying the canton chieftaincy (the chefs de canton), they ripped out a whole middle stratum of the administration at the same they were setting forth a very ambitious, modernist set of goals. So in some sense their politics was absolutely coherent for the moment they had lived through in the 1950s and earlier, but it had unanticipated effects. BfB: What was their primary grief with traditional authority? GM: It was precisely that it wasn’t traditional: it was disguised as traditional [see “the invention of tradition“], but it was rapacious, it was feudal, it was anti-democratic, anti-egalitarian, and lay behind systems of extreme social hierarchy and slavery of earlier decades. So their opposition to that kind of authority makes a lot of sense, it’s coherent. The irony is that the one place where the RDA didn’t break chiefly power, and explicitly chose a more ambiguous line, was with the Kel Adagh in northern Mali. The RDA acted as the colonial regime would have acted: they said, “We won’t accept this candidate, we want that person to be chief,” they manipulated the chieftaincy. They tried to reform it, to limit its capacity, but they didn’t try to take it apart or abolish it. So in fact the system of government that perdured in the Kel Adagh territory has always been distinct… right through the time of President Alpha Konaré in the 1990s, it’s always been a distinct form of government in which “traditional authority” has existed [notably in the office of the amenokal, or chief]. All this came back into play with the process of decentralization that began in the 1990s, but that too was an echo of the 1950s and 1960s: decentralization was originally an RDA project. BfB: You write that in the late 1950s and early ‘60s, controversies concerning the persistence of slavery “made good press” in the Sahel. These controversies centered on allegations that certain Tuareg pilgrims were using the hajj [pilgrimage to Mecca] as a pretext to sell black slaves in Saudi Arabia. To what extent can we know whether this problem was real or something perceived by the nationalists of the RDA? How much do we really know about this phenomenon? GM: It’s a great question because it’s hazy. Bruce Hall has written about it a little bit; Baz Lecocq is working on it. On the question of whether a slave trade existed and were people being sold in the Hijaz, having been brought from West Africa under cover of the pilgrimage in the late 1950s and early 1960s, Baz is more skeptical than I am, actually. Baz has done more research than I have… it seems to me like the evidence is pretty good, but that’s the RDA evidence, and it’s also the French state, the commissioners of the pilgrimage in the late ‘50s saying that this stuff is going on. BfB: These days, you can read characterizations in the Bamako press that describe separatists as “esclavagistes.” Is this the same perception being expressed 50 years later? Has the situation not changed that much in two generations? GM: It’s certainly a deeply rooted racial stereotype in Mali, there’s no question about that. On the one hand, many people of Tuareg origin, and many people of Mande origin can coexist quite well, but if pejoratives are going to be tossed about, that’s certainly one that’s going to be tossed. It speaks to the social hierarchies that are prevalent in the north but function much more discreetly in the south. BfB: In chapter 2 you also mention the view articulated by the US-RDA, following the breakup of the Mali Federation in September 1960, that Senegal coveted Mali’s riches. This recalls current discourse about Mali’s “geostrategic significance” and its mineral resources. Was the idea that Senegal was coveting Mali’s wealth a sincere belief in 1960, or just the RDA’s ex-post-facto justification for the collapse of the federation? Was there something to it? GM: I think the RDA believed it was true; I think they saw Mali as the breadbasket, the source of agricultural riches (including the pastoral riches) of Sahelian West Africa, and they thought Senegal relied on that form of wealth. Which is a very particular vision of wealth—they weren’t talking about things traded on distant markets, they were talking about primary agricultural commodities. But they firmly believed that it was the case, and they over-estimated their importance to Senegal. I think they believed it, and I think they were precisely wrong. 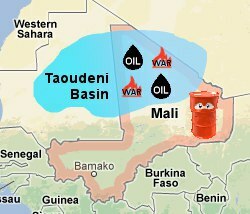 BfB: Let’s come back to the present day, when different accounts (both from Mali and abroad) portray insecurity in northern Mali as a product of oil and gas interests or mineral interests, when many see great geostrategic stakes in Mali generally, and in the north in particular, driving the conflict. Is this a similar exaggeration of Mali’s importance to the outside world? GM: This idea was circulating among some Western diplomats, especially in 2012 and 2013, that Mali had what they would sometimes call a “paranoid nationalism,” that Malians rejected any outside interference, especially of ECOWAS, because they were “paranoid nationalists.” But I think that historical memory in Mali would recognize the historical contingency of Malian sovereignty from the get-go, there was always this idea of being under siege. The collapse of the Mali Federation, the fact that Algeria was still at war when Mali became independent, the instabilities provoked by the French currency manipulations, especially in 1994—you’re not paranoid if you recognize a delicate situation for what it is, not something to be taken for granted. But the question of mineral wealth in the north, and whether or not the conflict is being ginned up in various ways as a struggle over these plots for potential future exploitation of oil and gas—I always found that argument very reductive. The possibility of profitable extraction has always been more hypothetical than anything else. The actors who are most prominent (Algeria, Canada, China, Italy) have more interest in stability than in instability. And I don’t see what the supposed end game of ginning up a separatist movement would actually be for them; what would the gain be? As you’ve pointed out in your blog, it’s not like the Malian government was known for its rectitude; there are cheaper and easier ways to make a deal than to provoke a civil war. But it’s a classic way of envisioning imperialism, it goes back to Lenin, and Nkrumah modernized it with his views of neocolonialism as being fundamentally about the extraction of mineral wealth in particular. But I just think it’s very reductive. My understanding is that the oil that might be in the north, even if it could be gotten out of that territory, isn’t even appropriate for most refineries; only the Chinese could really use most of it. We have a glut of oil production in the US, not a deficit, and prices are at a historic low, but they’ve been going down for a few years, even before the conflict had really begun. So it’s not as if this is happening in the context of a sharp scramble for a scarce resource. In fact an explosion of oil extraction technologies has brought about a glut on the market. The US interest in the Sahel is not an oil and energy interest, it seems to me, and I don’t think that of the other players is primarily oil and energy either. Algeria is its own complicated scenario, but even the Algerian interest is more about making life difficult for other people than about exploiting these plots themselves. I’ve just always been a skeptic of that argument—it’s too easy. And it makes the people of the north essentially dupes of outside powers, which is quite dismissive of a set of concerns, some of which may be legitimate and others may be overwrought, but which are nonetheless deeply felt, even if only by a small minority. – Thanks to Professor Mann for granting this interview. This entry was posted in Uncategorized and tagged books, politics, Tuareg. Bookmark the permalink. Zoals beloofd hierbij deel 2 van 2. Thanks for sharing this incisive set of interviews – I’m looking forward to reading the book!